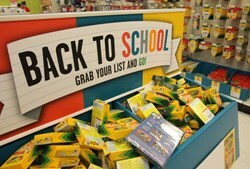 Ohio is offering tax-free back-to-school shopping on clothes, shoes, school supplies Aug. 7-9. The sales tax holiday applies to purchases made from 12:01 a.m. Friday, Aug. 7, through 11:59 p.m. Sunday, Aug. 9. Ohio passed legislation last year exempting sales tax on purchases of clothing and footwear priced at up to $75 per item, as well as school supplies and instructional materials priced at up to $20 per item. Consumers can buy as much as they want of eligible items, as long as the retail price for each item does not exceed the limit. The state defines clothing as "all human wearing apparel suitable for general use," including but not limited to "shirts, blouses, sweaters, pants, shorts, skirts, dresses, uniforms (athletic and nonathletic), shoes and shoe laces, insoles for shoes, sneakers, sandals, boots, overshoes, slippers, steel-toed shoes, underwear, socks and stockings, hosiery, pantyhose, footlets, coats and jackets, rainwear, gloves and mittens for general use, hats and caps, ear muffs, belts and suspenders, neckties, scarves, aprons (household and shop), lab coats, athletic supporters, bathing suits and caps, beach capes and coats, costumes, baby receiving blankets, diapers (children and adult, including disposable diapers), rubber pants, garters and garter belts, girdles, formal wear, and wedding apparel." Check your student’s school web site for supply lists.